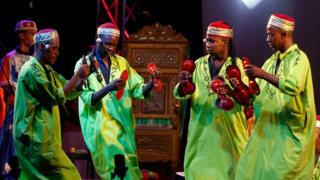 The annual Carthage international music festival was under way in Tunisia with this performance featuring groups from Tunisia, Morocco and Algeria on Monday. 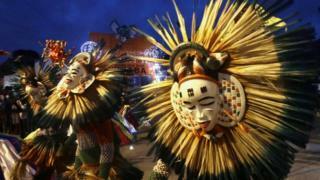 Meanwhile, Ivory Coast has been playing host to the Francophone Games, which focus on culture and art – as well as sport. 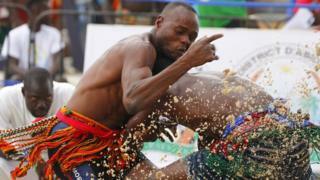 Here Debe Blaise of Burkina Faso (right) takes on Niger’s Garba Mourtala in the men’s wrestling 66kg quarter-final on Thursday 28 July. 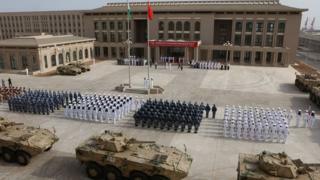 Tuesday saw the opening ceremony for China’s first overseas military base – in Djibouti. 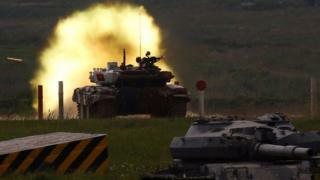 Chinese authorities have dismissed concerns about China’s expanding military prowess, arguing that the base will be used for defensive purposes. It will support ships travelling near the Horn of Africa, as well as peacekeeping and humanitarian operations. 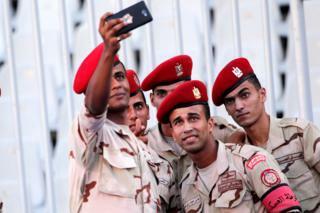 On a lighter note, Egyptian military police soldiers are pictured here taking a selfie before the beginning of the football match on Sunday between ES Tunis and Al Hilal during the Arab Club championship in Alexandria. 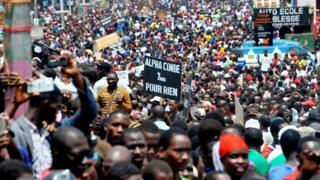 In Guinea, thousands of opposition activists took to the streets of the capital, Conakry, on Wednesday to press for local elections to be held after a gap of 12 years. 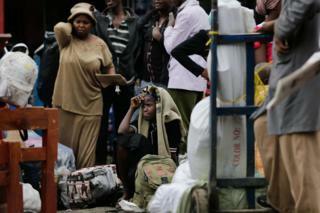 And next week’s election is very much at the forefront of attention in Kenya. People are already heading from the capital to rural homelands – to vote and in some cases to be away from the city, fearing there may be violence in the aftermath. A closing ceremony on Sunday marked the completion of the Francophone Games in Ivory Coast, which drew some 3,000 participants.